My modern (Graham based technique) dance class accompaniment CD. Instruments used are voice, piano, guitars and percussion. The last three tracks are from the 'Red' sessions, but entirely appropriate for movement! 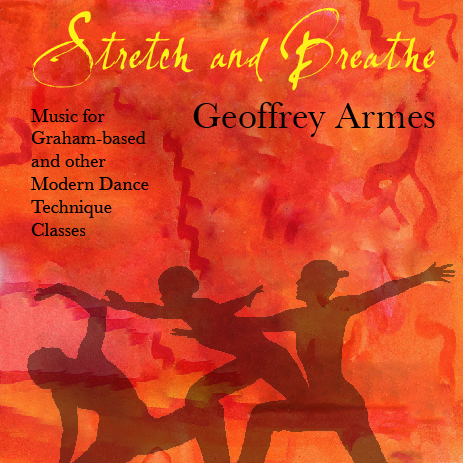 Over the years of accompanying modern dance, and composing for the same I was often asked why I didn't produce a CD of music especially for the technique class. On a couple of occasions notable teachers from the Martha Graham world (Thea Barnes, Kazuko Hirayabashi) took me into the studio and we produced rather hasty solo piano tapes and CDs around their particular syllabuses. Then I took a hiatus from the whole business, preferring to focus on writing about music and spending time with my daughter. Year 2000 found me back in the fray, and I decided to do something about the requests. Trusty Casette 4-Track Tascam in hand, I took Greek dancer/choreographer Penny Dimitopoulou and myself to the booming halls of the Subud Chelsea Center where I wailed on djembes, dumbeks and talking drums, as well as improvised on the battered baby-grand piano (an instrument entirely reminiscent of so many I had played whole classes on in the past). Then I went home, and added more: vocals, udu, guitars and bass. The third stage was a visit to Quentin, over at his then embryonic MediaNoise, whose skill with mastering software brought the recording-quality up to standard. Since then I've made the CD available on an ad-hoc basis, with differing sets of artwork, and I am now doing so again. Some of the dance groups I have worked with include: In London -- Laban Centre, London Contemporary Dance, Rambert Academy. In Germany -- Ellys, Tanz-Akademie Koeln. In Rotterdam -- Dans Akademie. In New York -- Martha Graham, Jose Limon, Merce Cunningham, Alvin Ailey, Paul Taylor.